Drapes fabricated by Exclusively Expo are "made to order" to each customer's specifications. 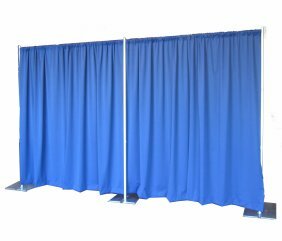 Trade show drapes are typically made from Banjo Cloth . 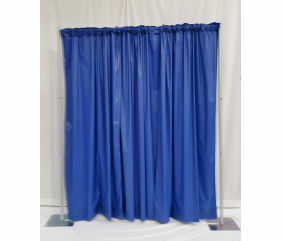 The standard drape height for "our" pipe system is a 94" high back and a 34" high side with a 4" rod pocket on both the top and bottom of the drape. However, we produce all manner of heights and pocket sizes on a daily basis per customer requirements. 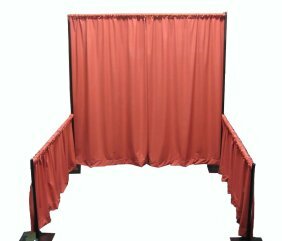 We also offer an upgrade drape which we call Premier. 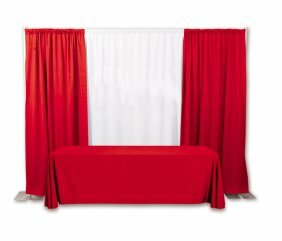 These drapes have a "linen look" and are used more often for meeting rooms, offices, schools, banquet facilities, etc. 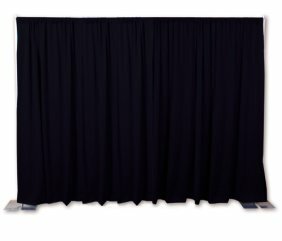 These drapes come in panels that are 60" wide. For the specialty decorating and audio visual markets we produce drapes of velour, duvetyne, umbra, and velfab. All of these products are custom sewn per customer specification. Disposable vinyl drapes are available in 54" widths and the height of your choice. You specify the quantity, color, height, and whether you need a rod pocket at both ends, or just on top. We send your exact needs to you on rolls that are perforated at the heights you want... just tear off and hang.